Slipcovers used to be something you would use to protect the living room sofa or chair. Now they have become the great go-to instead of buying new sofas or chairs. From ottomans, sofas, benches or chairs, slip covers are a great way to change the look of your room using different color, texture and patterned fabrics. They have come a long, long way, baby. 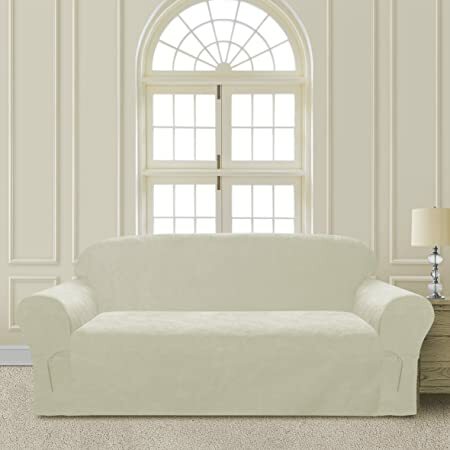 Belgian Pearls has a blog post called Be Seated about slipcovers for sofas and chair slipcovers, not loose or ill-fitting but the most beautiful tailored, Belgian linen slipcovers. Because they are so versatile, high-end slipcovers for sofas, seats and chair covers, have become very fashionable with international designers. You can use them for special occasions, different seasons, casual, formal or as mood boosters. They take into account design elements such as color, shape, texture, space and form so slip covers blend seamlessly with the interior design of the room. These slipcovers are beautiful; haute couture for your furniture! Something Audrey Hepburn would be proud to wear. 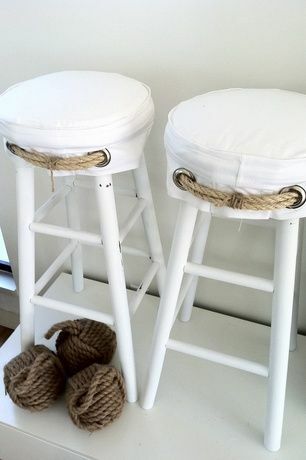 You can also use them for bar stools or an ottoman, a bench or a table. But like all things high-end, there is often a very high cost that goes with it. But don't let that stop you. This cover costs less than $40 and is easy to wash. From dining chairs to sofas, there is a solution perfect that will look amazing and cost little to create. Of course, you can do it yourself! You don't actually need a lot of skill or materials to create your own basic slip covers; the more detailed the more skills you will need to create a professional job. But one of the easiest ways to create your own pattern is to take apart the existing slip cover, using each of the pieces as a guide as to how many pieces you need and the shape! You can create cushion covers like the one below - perfect if you are in a hurry, lack skills or just want to see what the fabric might look like! Follow this link to a no-sew cushion tutorial. Its an easy no-sew solution when you need one. From fine, exclusive slipcovers to something a little less expensive but equally attractive from Addicted2Decorating in the article Gorgeous Light and Bright Slipcovers For a Sunroom. Design elements aside, the choice of fabric, detail and tailoring all contribute to the look and feel your slipcovers can create. 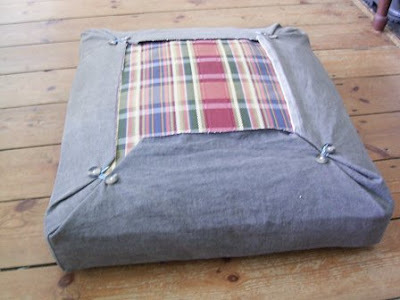 There are lots of cheat seat tutorials out there for slip covers like this one below. The best thing is they are so easy to clean! The chair slipcovers are practical and easy to care unlike fine linen chair covers. 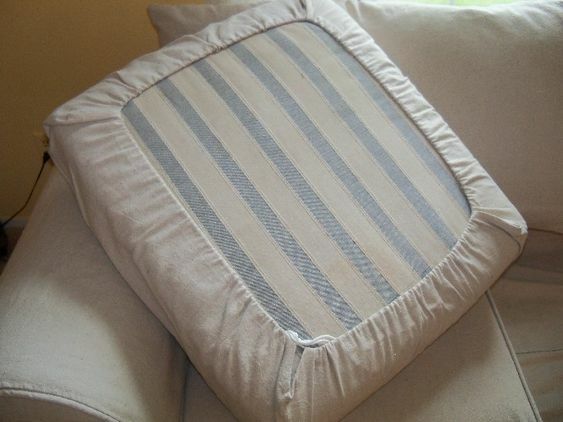 Here's an ebook called Pillow Talk Ebook to show you how to create your own slipcovers. Please leave a comment on your slipcovers for sofas adventures - 'before and after' of chair slipcovers are always nice..and join our newsletter! !